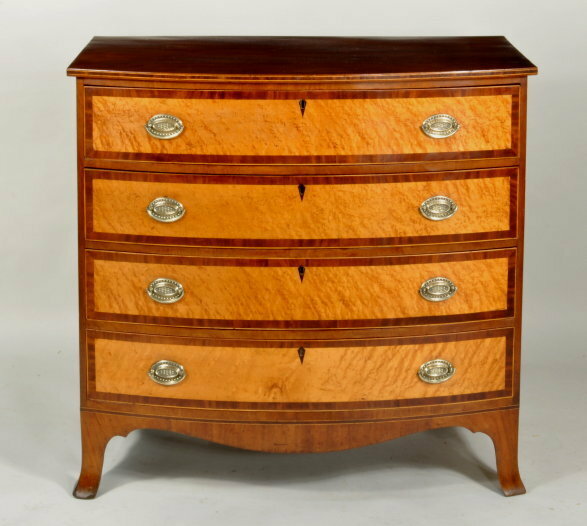 Fine hepplewhite inlaid mahogany swell front chest, with figured mahogany top with wide crossbanded mahogany and string inlaid front edge, above a conforming case with four drawers with figured maple veneered fronts and crossbanded border, diamond inlaid escutcheons and original oval brasses, set on flaring front front feet with shaped apron. Boston area, circa 1790-1800. 41" wide, 39" high, 18 1/2" deep.